For a writer of whom Radio 2 once said, “One of those writers on whom critics have already lavished almost every word of praise possible”, it’s somewhat surprising that today Christopher Hodder-Williams is pretty much forgotten. He published eleven sf novels between 1959 and 1984, and most of them are difficult to find these days. Near at hand was the smallest box of all. It measured about six inches across by two inches down by four inches deep. I thought I saw something flickering on the front… the first sign of activity. Through the rapidly thickening smoke I now saw that this box was linked by plastic strip to the other units mounted at intervals below. These were already flooded with water. Then the fumes cleared for a second and I saw what it was that had moved on the little box. 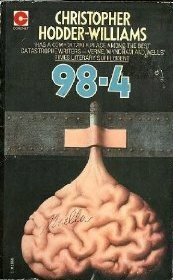 98.4 is more like a daft techno-thriller than it is a science fiction novel. It’s a quick, fun read, and well-crafted, even if elements of the story stretch credulity somewhat. For the time-being, it’ll stay on the British SF Masterworks list… at least until I’ve read more by Hodder-Williams. Categories: book review, british sf masterwork, christopher hodder-williams, science fiction | Permalink. I really appreciate this British SF Masterwork series you are doing. It’s a very good idea. Keep it up! Don’t worry. I have plenty more books to review from the list.